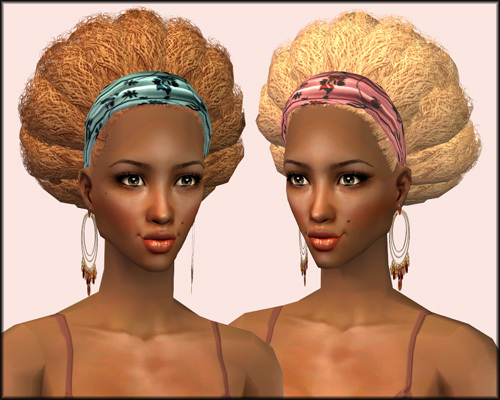 Afro Hairband - An afro hairdo for our ethnic ladies! Dedicated to my friend Solange who is going through a tough time. - hairband is not removable this time. - Dr_Pixel and Wes_H and SkankyBoy and Milkshape dude and SimPE dude for providing the tools! 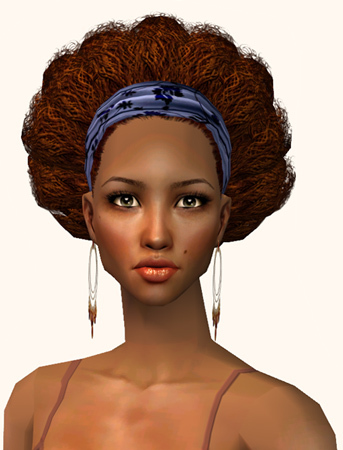 - Don't upload unless you actually recolor and/or retexture. - Recolor, retexture and stuff, but don't edit the mesh. - Don't forget the credits and a link, because people will want to find the original. Punky shortyHair Recolors - From Teen up! Cute High Ponytail: A cute bunlike ponytail for ladies of all ages!